One of the questions inspiring Looper is "What would you do if you were sitting across the table from your older self?" 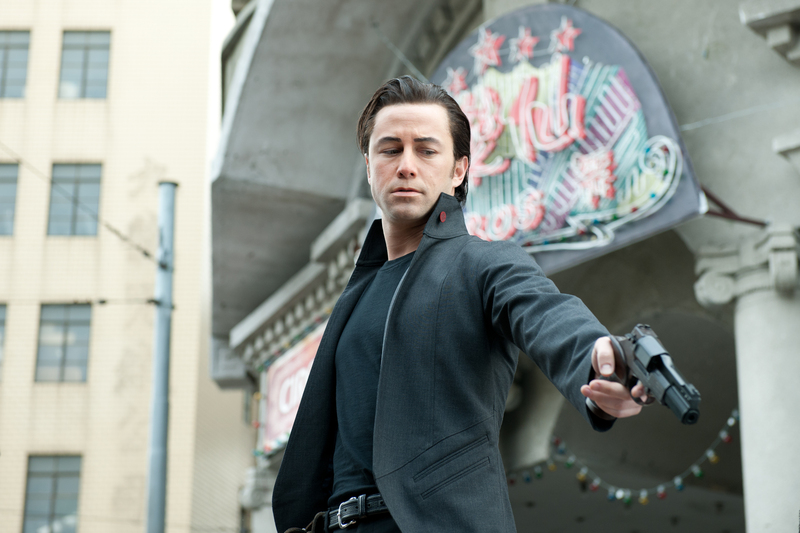 Director Rian Johnson (Brick, The Brothers Bloom) has made a time travel sci-fi film called Looper, about Loopers, men alive 30 years before time travel is invented who wait at locations as mob hitmen, who take out people sent back in time to them. It's a great concept, until, as the question asks, what if the guy sent back was you. In the film, Bruce Willis plays the older version of Joseph Gordon-Levitt. While we've seen a good look at Bruce, this is our first good look at Joe playing Joe as Bruce, in make-up. 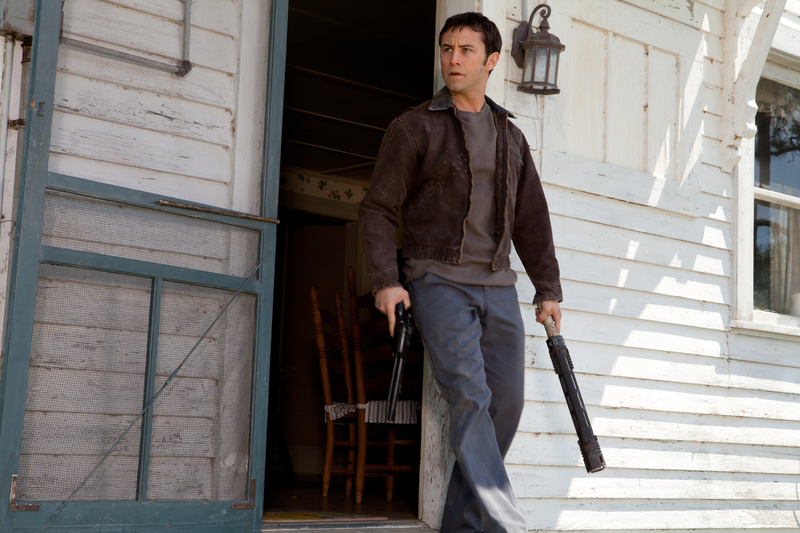 Looper is the third film from Rian Johnson following his breakout hit Brick and The Brothers Bloom after that. 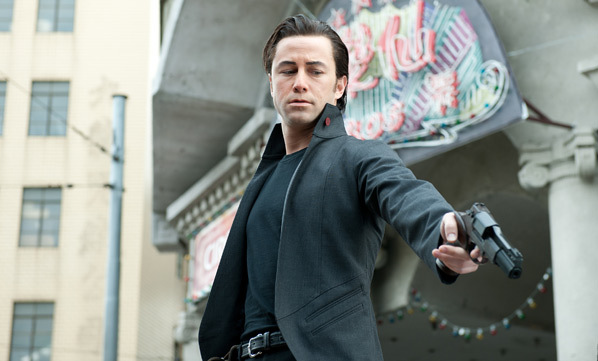 Looper focuses on a mobster named Joe from the future who sends his targets back in time, but one day discovers himself as the target, causing him to go on the run. It may seem like a spoiler to know that he meets "himself", but it's the basic premises for the plot of the film, and we definitely see it in the trailer. But it goes much further beyond that, and there's a hint at bigger sci-fi questions as well, and lots and lots of gun fights and action. We'll definitely keep you updated on this one. My Rian Johnson interview coming soon! What happened to his face? Is that what you mean by "in make-up"? And if so, what is the reason for it? Any insight? Sounds like a really cool film. It's because he's supposed to look like a young Bruce Willis... Alex said that above the pics, where he also links to a pic from this film of Bruce. Hey, Hey! Nice Mateba hand gun! He looks more like Brad Pitt in the second one, haha! Looks badass nevertheless. I really see the Bruce Willis resemblance in the pic with the long hair. The Oval face, and the nose. The beady eyes and small mouth. This is gonna be a great movie. The script was better than Inception's. 2012 is gonna be for JGL for 2011 was for Gosling. He looks like Willis, awesome. Kind of has a Michael Fasbender thing going on. Alex Billington, where is the Pistol? [Insert Darth Vader via Ep. 3] NOOOOO! [Insert Darth Vader via Ep. VI] NO NOOOOOOOOOOOO!